You go into any professional recording studio today and the first thing you should still see is a big analogue mixing console. Digital mixing or summing inside a DAW running on a computer just isn't the same. Compared to the warmth, depth and dynamics of an anlogue mix, digital mixes are often found to be flat, cold, muddy and very two dimensional. Why compromise on sound? 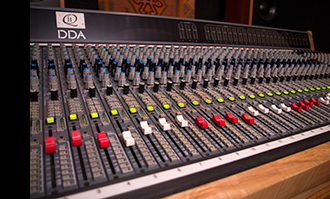 Our analogue console is a British 32 channel DDA Q2 and one with some history. It spent the 1990's in the London Astoria, front of house mixing and being involved in the live recordings for such artists as David Bowie, Radiohead, The Cranberries, Nirvana, Caravan... to name just a few... Restored to former glory, it now forms the centerpiece of our mixing studio. Wired into the console we have 4 x UA Apollo audio interfaces for a total of 48 output channels at mixdown. The interfaces also contain 12 cores of UAD digital processing for channel FX using award winning plugins from the likes of Neve, EMT, Roland, AKG, Manley, Moog, Eventide and Thermionic Culture. Supplimenting the analogue side of the mix, we have a range of vintage EQ's and compressors for use on the group busses and a number of external hardware FX for use on individual channel inserts if required.